Planning a big day, I woke to my alarm at 4:00 AM at the Easy Pass trailhead. It felt surprisingly cold out, so when it started sprinkling about 30 seconds later, I changed plans and went right back to sleep. Waking up again at a civilized hour, I spent a lazy morning reading; then, feeling guilty about doing nothing with what had turned into a perfect day, I skimmed my map and settled on Crater Peak. 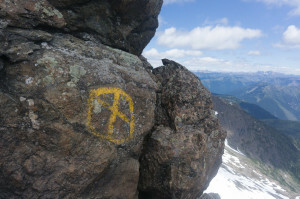 Neither high nor “serious” enough to have made my list — 8,100 feet with a trail to the top — it seemed like a peak that would leave me rested enough for something real the next day. Also, the reason for said trail, a crazy-high summit fire lookout from the 20s and 30s, was intriguing. 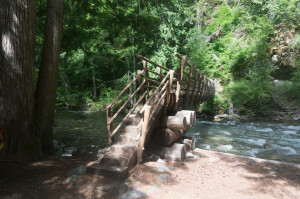 I drove down to the Canyon Creek trailhead, offloaded some extra food, and took off across two bridges and through a minor trail maze. 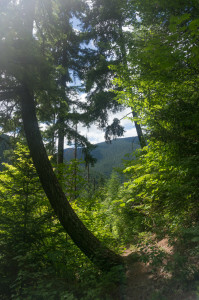 Like many trails of the pre-ADA era, the Crater Peak trail is well-constructed and businesslike, grinding out 4,000 feet of forest in steep, steady switchbacks. 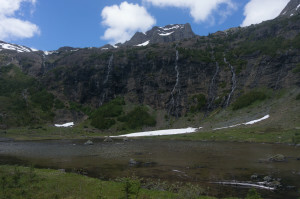 Finally leveling off, it passes some campsites, then exits the forest at Crater Lake in the cliffy cirque between Crater and its eastern subpeak. The lookout trail is somewhat fainter here, but still apparently well-used enough to survive. 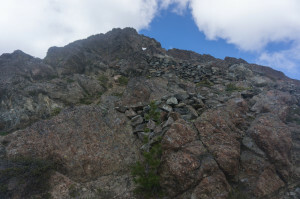 I followed the trail through grass and up built-up switchbacks to the base of the final summit tower, where the packers apparently once left supplies to be hauled the rest of the way by a pulley system. The trail becomes abruptly worse here, but it is easy to follow cairns and, later, yellow X’s and arrows up the convoluted series of ledges and class 2-3 steps to the slanted summit plateau. Constructing a lookout up here without helicopters, and before the current highway 20, took an impressive amount of work. From the top of the tram, a somewhat improved trail switchbacks to the summit. I would normally shortcut such useless switchbacks, but I followed these out of respect for the hardy and bored lookouts who had taken the time to engineer a trail used only by themselves. 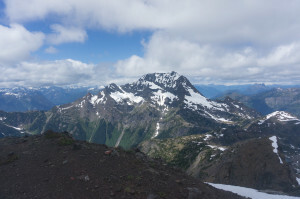 The view was all that was advertised, with neighboring Jack looming just to the northwest, the Hozomeen Peaks to the north, and the rest of the north Cascades stretched out to the south and west. Sadly, the lookout has been almost entirely removed, and only an odd metal pipe remains. It was unpleasantly cold and windy, so I ate and photographed quickly, then retreated to the warm and sheltered forest. I mostly jogged the return, stopping to let some backpackers get control of their vicious dog, then again for water at a stream crossing. This would have been a good peak to speed-climb, but I held back, saving energy for grimmer things the next day. Now that’s cool! No photos of the lookout structure??? Unfortunately, there was nothing left but a metal pole. It was a permanent structure for awhile in the 1930s, though.